A log cabin focusing on dual purposes with a traditional design, the Mokka Log Cabin. You have the enclosed log cabin measuring 4m x 4m, to the front is a covered veranda style area. The balustrade feature finishes this lovely 40mm log cabin. Overall it measures 9.00 x 4.00m. Perfect for use as a summerhouse and to the side you have a gazebo, sheltered area. Perfect for entertaining and outdoor dining. A log cabin focusing on dual purposes with a traditional design, the Mokka Log Cabin. You have the enclosed log cabin measuring 4m x 4m, perfect for use as a summerhouse and to the side you have a gazebo, sheltered area. Perfect for entertaining and outdoor dining. To the front is a covered veranda style area. The balustrade feature finishes this lovely 40mm log cabin. Overall it measures 9.00 x 4.00m. A lovely building, solid and strong being 40mm logs and designed for multiple uses. It can be installed with the canopy to the left or right of the cabin. This building is manufactured using 40mm slow grown Spruce - a variety specially selected for the interlocking construction. For a high quality finish and to comply with strict Dutch standards, Tuin log cabins do not feature a mixture of timbers or finger jointing. Arriving to you untreated, the Mokka can be customised to complement any garden theme. For the more traditional garden, choose a stain, or, to create an outstanding feature, be the envy of your friends and paint in bright colours! FREE roof Shingles: As a standard building you can select either roofing felt or FREE shingles. We cannot guarantee which colour or shape will be sent. We will always let you know the colour and style following your order. It is rarely possible to change those offered as it is dependant on our stocks. Free shingles for this Mokka Gazebo Log Cabin are the same quality as our standard range and made by the same manufacturer. However, they are last years stock and old range colours, also some packaging may not be 'as new'. Standard Roof Shingles: These are from our standard catalogue range and are available in various colours and styles. We highly recommend shingles with your log cabin: The final finish is far more superior and turns a shed into a stunning log cabin. Ordinary felt will last two - three years. Shingles will last for at least 15 years and it is unlikely you will ever need to replace them. Free Shingles offer * Free shingles for this Log Cabin are the same quality as our standard range and made by the same manufacturer. However, they are last year's stock and old range colours, also some packaging may not be 'as new'. Floor Required Finish off your Log Cabin with a floating floor, floor joists are included ONLY if you order a floor with your Mokka Log Cabin. Floor not required 18mm Floor required (+£362.12) Ideal when using your Mokka Log Cabin for storage or as a summerhouse. 26mm Floor Required (+£510.55) Ideal when using your Mokka Log Cabin all year around for example as a heavy duty storage solution, home office or craft room. HQ Floor Required (+£618.66) The highest quality floor we provide, ideal for varnishing and use of a presentation floor. Standard Foundations included Foundation beams are essential for any Log Cabin build to ensure untreated wood is not directly on the ground. Tanalised Profiled (+£74.52) Profiled to allow water to be drawn away from the first log of your Mokka Log Cabin. Hardwood Profiled (+£232.20) When regularly oiled these add an extra level of aesthetic to your Log Cabin. Composite Profiled (+£194.40) Made from recycled plastic that will never rot. Delivery time for the Mokka Log Cabin Gazebo is 7 - 14 working days. Deliveries are carried out by external hauliers or carriers, Log Cabins are delivered with a fully articulated lorry with a moffett forklift. 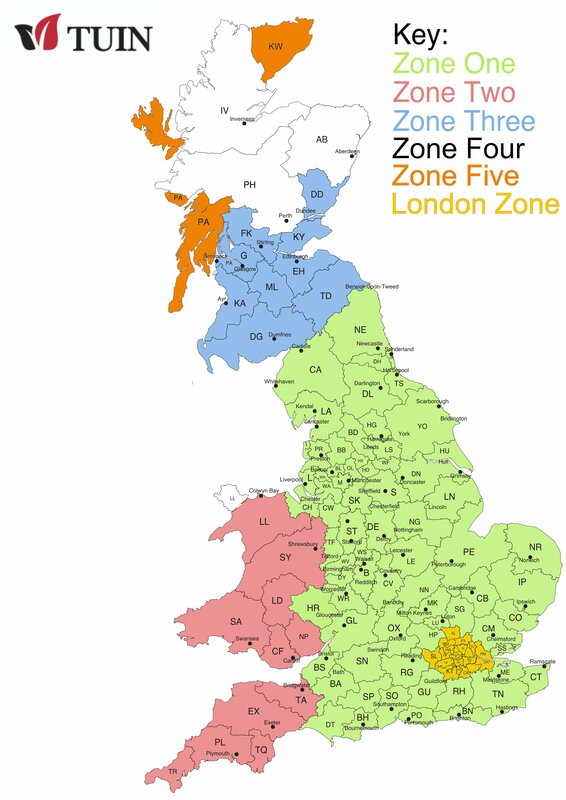 Please see the map below to determine what zone you will need to select. Internal Dimensions Internal Dimensions of the main compartment in the log cabin rounded up or down. Minimum Base Size Base size required for the cabin with standard foundation beams. A log cabin focusing on dual purposes with a traditional design, the Avon Log Cabin. You have the enclosed log cabin measuring 3m x 4m, perfect for use as a summerhouse and to the side you have a gazebo, sheltered area. Perfect for entertaining and outdoor dining. To the front is a covered veranda style area. The balustrade feature finishes this lovely 40mm log cabin. Overall it measures 8.00 x 4.00m. Another one of our log cabins focusing on dual purposes, you have the enclosed log cabin measuring 2.50 x 3.50m, perfect for use as a summerhouse and to the side you have a gazebo, sheltered area. Perfect for entertaining and outdoor dining. To the front is a covered veranda style area. The balustrade feature finishes this lovely 40mm log cabin. Overall it measures 7.00 x 3.50m. 70mm Log Garage With Carport, the Berggren measures 4.0x8.30m. A substantial apex roof building, split into two to provide both a garage and carport. Overall this building is 7.65m x 8.30m. Bi-folding doors, hipped roof, double glazing, 45mm and a really useful cabin size of 4.20 x 4.20m this building has it all including a 2.8m covered area which can be placed either left or right as decided at the point of installation. Overall the Torkel measures 7.0 x 4.2m. A 45mm Log Cabin Storage shed, Annexe 1.6x3m. Suitable for most log cabins. This model is slightly larger than its 28mm version. A handy lean to porch for your log cabin, ideal for keeping your bicycle dry or even drying logs for your wood burner. The width is 1.50m. Available in two lengths of 1.75m and 2.75m. Heat from above! A Ceiling mounted heater, great for your log cabin canpoies or gazebo, or in fact any garden building or space you need some quick heat into. Not for indoor use. Garden Building Wall Heater, a very easy and quick way to give yourself some heat in your gazebo or perhaps a log cabin, your always one click away from some quick heat. We only supply the best and IKO is the world renowned leader of felt shingles. Used all over the world they will protect your log cabin or garden building. We are one of the largest suppliers of IKO across Europe and as such we offer the largest range in the UK at the very best prices. Each pack of felt roof shingles covers an area of 3m.sq Often we even have free offers on across our log cabins and other garden buildings and structures, look out for them! This is generally used for our log cabins and specifically for those with support posts either as part of a gazebo or as a veranda. Using these mean you can adjust the post according to seasonal variations, it will also of course secure it to the ground which is a must. A log cabin with dual purpose in mind, the Selma Log Cabin Gazebo features an enclosed cabin of 1.58m x 3.5m, perfect for storage or a mini bar area. To the side is a covered gazebo, sheltered area. Measuring at 4m x 3.5m, the Selma is perfect for hosting, entertaining and outdoor dining. Overall the cabin measures to 5.78m x 3.50m.